We are staying at Stone Gables Bed and Breakfast in Cleveland OH, having filled up on a wonderful breakfast prepared by Richard, we are ready for a day of adventure. Traveling east of Cleveland we arrive at The Holden Arboretum in Kirtland, it is our first visit, I can hardly wait to check it out. 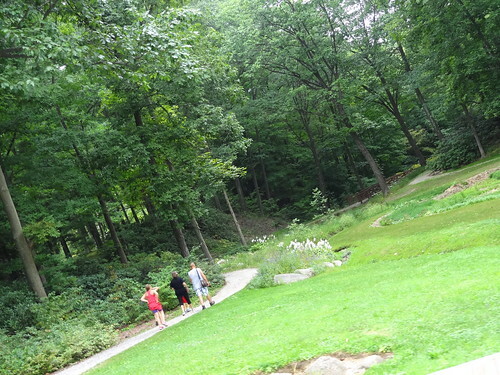 Holden Arboretum was started in 1931, a bequest from Albert Fairchild Holden created as a memorial for his oldest daughter Elizabeth who died of scarlet fever at the age of 12. 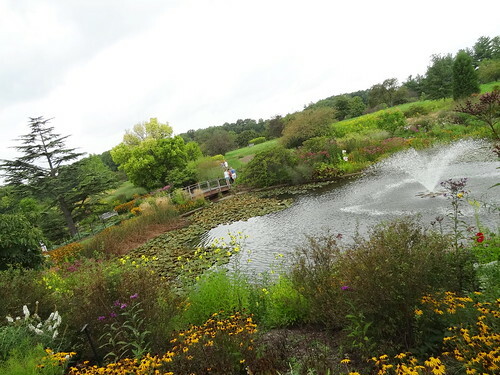 The arboretum is a collection of woody plants that are labeled, cataloged and mapped; here you will find cultivated gardens, forest trails, woodlands and 20 miles of hiking trails covering the 3,500 acres. 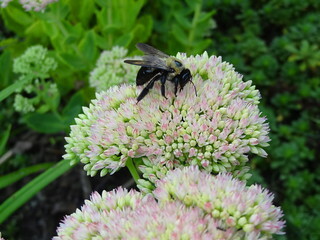 Directly behind the visitor’s center lies the Butterfly Garden, carefully trimmed grass pathways lead past beds bursting with Purple Coneflowers, Black Eyed Susans, Sedum and more. Crossing a footbridge we stop halfway and watch as water passes over stacked rock creating a shallow waterfall. Foster Pond, thick with lilypads, is surrounded by plantings of late blooming perennials, daylilies and Trumpet Vine; bees and butterflies are everywhere. I overhear talk of a Tram Tour and discover there are still two seats available for the next tour. 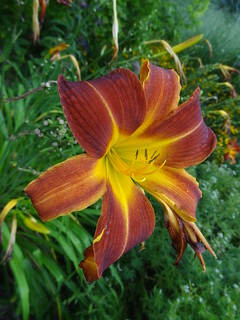 Making our way over to the tram we pass one beautiful bed after another; Hibiscus wear blooms the size of dinner plates, yellow Coreopsis, purple Bee Balm and Cardinal Flowers add bright splashes of color. We board the tiny white tram with three other visitors, the total capacity of the golf-cart-like vehicle is six, making for a very personal tour; the trail is hard-packed, used by pedestrians and trams alike. Traveling past mature trees our friendly, knowledgeable guide stops off and on telling us interesting facts, we glide past Ponderosa Pines, a wildflower garden and Blueberry Pond, its glass-like surface reflecting the nearby scenery. 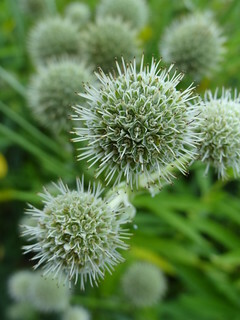 The grounds are breathtaking; lush green grass, ponds, pines, carefully placed benches invite guests to linger and relax. Off to the side a patch of Jewelweed is in full bloom, our guide invites a member of our group to carefully pinch off a seed pod for the rest of us to see. 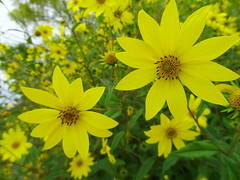 She instructs him to place the pod in the palm of his hand, then tap the pod, all of us jump when the pod explodes sending seeds into the air, appropriately, the plant’s nickname is Touch-Me-Not! Approaching the Rhododendron Discovery Garden, we are greeted by the Noreb Tree Allee, lined with Paperbark Hazels, Swamp White Oaks, American Elms and Flowering Dogwoods, this place must be incredible in the Spring. Two huge granite acorns welcome us, we cross through a gate, past a pretty pergola into the collection of Rhododendrons and Azaleas, here again a springtime visit would be ideal. 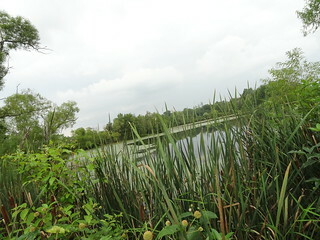 Corning Lake is home to tall reeds, cattails and Heron, a large turtle is resting in the grass. 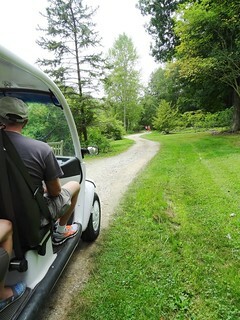 In one hour the tram leads us through all of Holden’s highlights, it is really the best way to become acquainted with the grounds. Driving south, we stop in the tiny town of Burton for lunch at a cafe. Fed and refreshed we arrive at Nelson-Kennedy Ledges State Park to do some hiking. 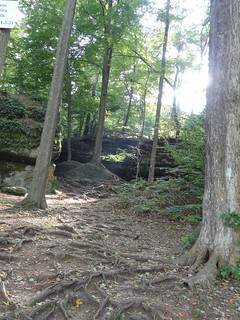 The day-use park is made up of 167 acres of rugged cliffs, four scenic hiking trails and diverse plant life. 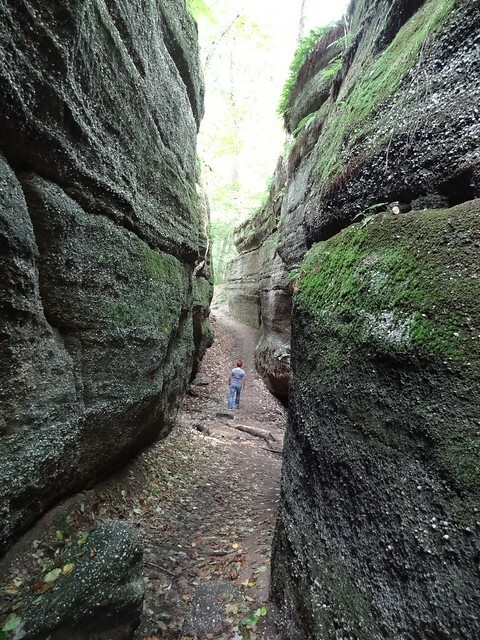 The park lies near one of the highest points of the state; a popular vacation spot, the state of Ohio created the Nelson-Kennedy Ledges State Park in 1949, preserving it for future generations. 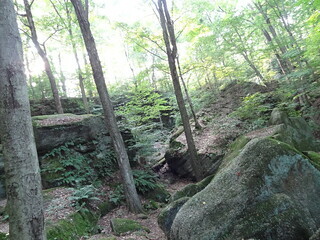 Rock formations found here are among the few outcrops in northern Ohio still exposed to view. The incredible sandstone cliff formations are a result of erosion; wind, water freezing-thawing, wore away at the softer rock layers. 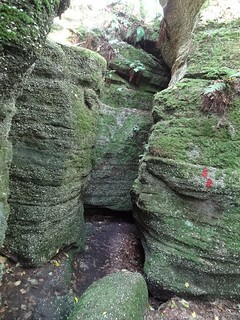 Large blocks of rock called slump blocks fell away, leaving the more resistant layers to form ledges. Rocks lay jumbled about, moss in a variety of shades and patterns covers the surface. At the trail head we choose the Red trail, it is the most difficult of the four, also the most interesting. Red dots are spray-painted on trunks of trees, sides of rocks, leading us over dirt trails, rock stairs and fresh puddles. 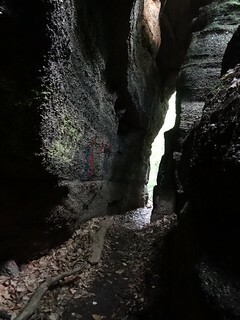 We descend the narrow space between two rock formations, the temperature drops noticeably, tiny white pebbles have worn smooth and are embedded into the rock. Trees are perched along the top edges, their roots exposed, clinging to each crevice. In shady areas ferns such as Christmas and Maidenhair grow wild, I read that in Spring Trillium are found in abundance, even the rare Red Trillium can be found here. We follow red dots catching a glimpse of a squirrel here and there, many songbirds can be found in the park. 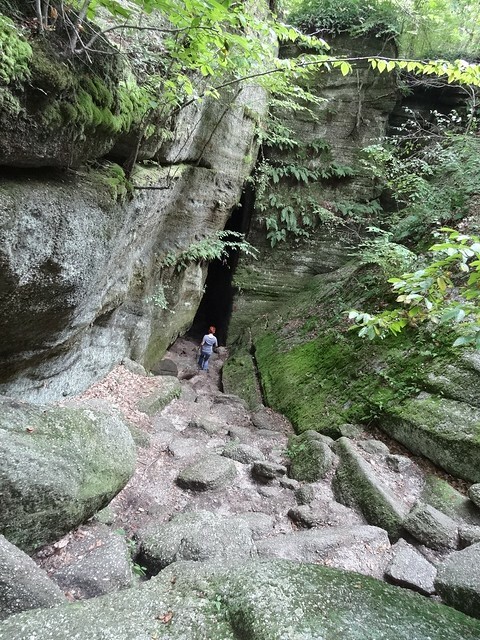 We are very low in elevation when we arrive at Fat Man’s Peril, here we have to duck down and squeeze between the rock surfaces, it’s dark too. The trail is loaded with places with names like Devil’s Icebox, Indian Pass, Old Maid’s Kitchen, posted signs urge us to stay on our path saying “Dangerous cliffs, stay on marked trails only”, good advice. 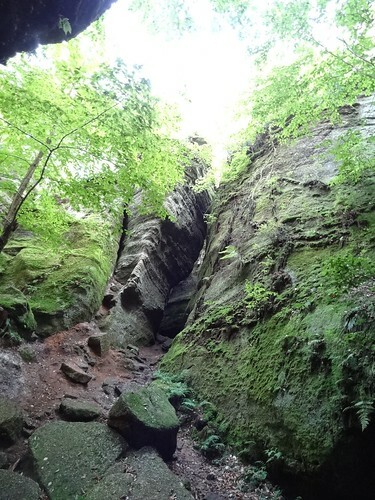 Slowly we make our way back up, the leafy canopy above providing refuge from the heat. Back at the trail head we follow a trail leading us in the opposite direction, the ground is covered in fallen leaves year round making for slippery stepping at times. 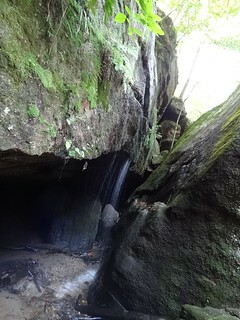 Reaching the boardwalk, we follow it around to a waterfall, today it is merely a fine spray of water passing over the rock face, the volume varies with the season. Speaking of waterfalls, we have one more place to visit. 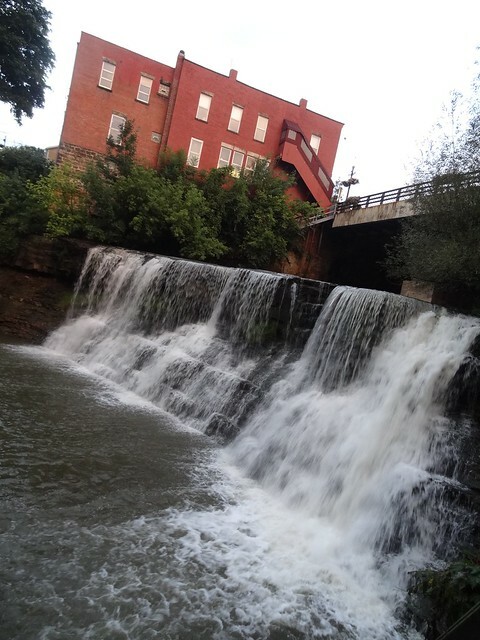 Chagrin Falls is one of those darling little towns that look like a set for a Hallmark movie. 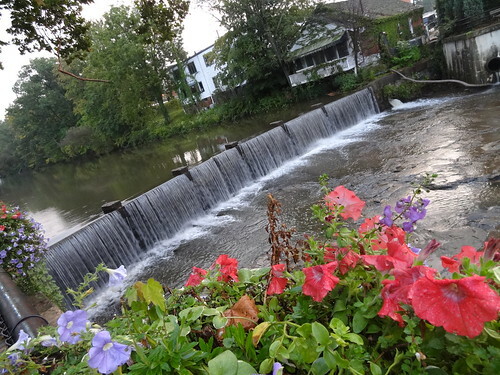 The Chagrin River runs right through the center of town, baskets of flowers cascade over the railing along the river, a fountain trickles in a tiny park riverside, the buildings themselves are quaint brick structures. The historic little village, an affluent suburb of Cleveland, is only 2.14 sq. miles, in it we find Greek Revival homes from the very early days, Italianate houses from the 1870’s, Queen Anne’s from the 1890’s and bungalows from the 20th century, they all look equally comfortable in their setting. The sky has become dark, we head directly for the falls before the clouds open up. An elevated wooden deck leads us down to the Chagrin Falls where the powerful river flows steadily over rocks, white water landing in the river below. Visitors pose for pictures, the scenery is lovely. On the opposite side of the water from us a large restaurant takes advantage of the spectacular view with lots of windows and a covered deck. It begins to rain, we quickly make our way to The Popcorn Shop on Main Street. 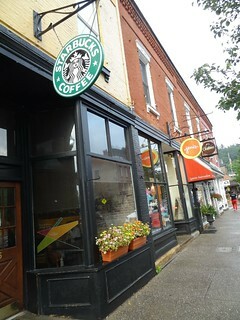 Businesses in town consist of specialty shops, art and antique stores, home goods, clothing stores and restaurants. 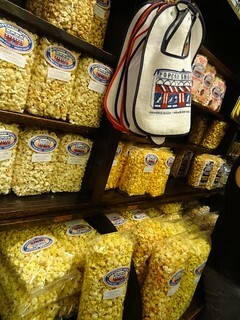 The Popcorn Shop is one of those places you have to visit when you are in town, decked out in red, white and blue, the building is charming, built in 1875 it originally was the retail end for the adjoining flour mill. 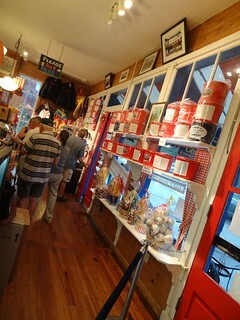 Sometime in the 1940’s it became a popcorn shop which also served homemade ice cream and candy, and so it is today. 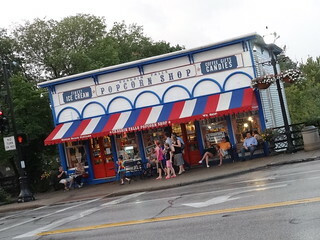 I love their caramel corn, it is simply the best, Kris is more of an ice cream type guy, he orders a waffle cone with a peanut butter ice cream that is truly to die for! The harder it rains the more crowded the shop becomes, until at last it lets up. We take the opportunity to stroll Main Street, every shop displays gorgeous urns stuffed with annuals, the scent of Petunias carried on the breeze. 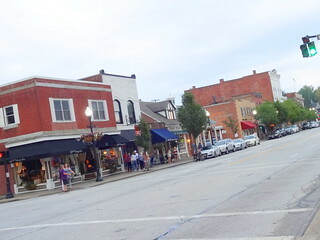 The town is quaint, walkable, picturesque, a great side trip when you are visiting Cleveland. It really is, you should check it out sometime!